Mighty heroes don't just appear out of thin air - they must be created! Race, class, alignment, skills, traits, and equipment are all elements of the perfect hero, ready to take on the opposition in the quest for glory and riches. 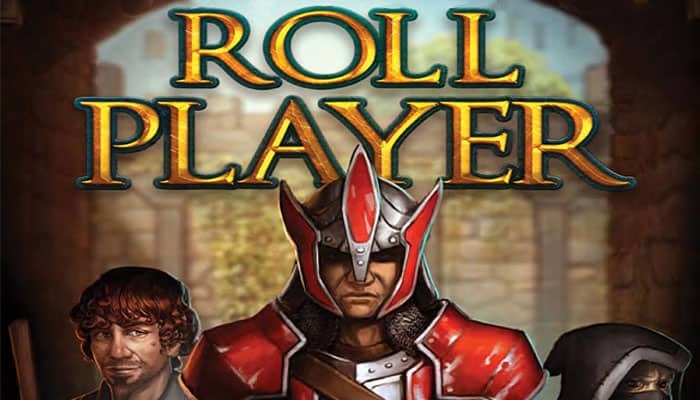 In Roll Player, you compete with your opponents to create the greatest fantasy adventurer who has ever lived, preparing to embark on an epic quest. Roll and draft dice to build up your character's attributes. Buy weapons and armor to outfit your hero. Train to gain skills and to discover your hero's traits, in order to prepare them for their journey. Earn reputation stars by constructing the perfect character. The player with the greatest Reputation wins the game and will surely triumph over whatever nefarious plot lies ahead! The Character Sheet is where a player 's character evolves over the course of the game. Each player develops a character by placing dice in the 18 spaces that make up the six Attribute Rows, and then enhances their character with Skills, Traits, Weapons, and Armor. This sheet is also used to track the character 's Alignment. Note that each sheet has both a male side and a female side, which differ only in the illustration. Each Character Sheet features a different Race, which can affect a character 's final Attribute Scores. Some Races have a bonus or penalty applied to specific Attribute Rows. A character 's Class is their profession in the world. Players receive a Class card during setup, which is placed here. A character 's Alignment indicates their personality and attitude toward the world and its inhabitants. Players receive an Alignment card during setup, which is placed here. Attribute Title - The name of the Attribute: Strength (STR), Dexterity (DEX), Constitution (CON), Intelligence (INT), Wisdom (WIS), and Charisma (CHA). Spaces - Each Attribute Row contains three spaces. As the game progresses, dice will be placed in these spaces. By the end of the game, all spaces will be filled. The dice in each Attribute Row are totaled to determine the character 's final Attribute Score. Attribute Action - A player may take an Attribute Action after placing a die in an Attribute Row; next to each row is a reminder symbol. Race bonus/penalty - Some Races receive a bonus or penalty for certain Attributes, which is applied during Final Scoring. The Backstory card reveals secrets about the character 's past. Players receive a Backstory card during setup, which is placed here. There are four areas around the outside of the Character Sheet for organizing Market cards bought during the game: Weapons, Armor, Traits, and Skills. The scoring conditions for the end of the game. Throughout the game, dice are drawn from the dice bag and placed in the Attribute Rows of each player 's Character Sheet. Draws are always made without looking in the bag. If a player accidentally draws too many dice from the dice bag, return them all to the bag and re-draw the appropriate number. Click here for detailed information about the Player Aid Cards, Class Cards, Backstory Cards, Alignment Cards, Market Cards and Initiative Cards. 1 All players roll a die. The player with the highest roll is the Start Player. Place all 73 dice into the dice bag. 2 Beginning with the Start Player and proceeding clockwise around the table, each player chooses a Character Sheet and selects the male or female side (gender choice does not affect gameplay). 3 Each player takes 5 Gold. If there is a third player, the third player in player order receives 1 additional Gold. If there is a fourth player, the fourth player in player order receives 2 additional Gold. The remaining Gold creates the Gold supply. 4 Beginning with the Start Player and proceeding clockwise around the table, each player draws a random die from the dice bag, takes the Class card of the matching color, and chooses one of the two Classes on the card. Example: A player draws a white die, takes the matching white CLERIC/PALADIN Class card, and chooses the Paladin. If the drawn die is gold, or matches another player 's color, continue to draw until a unique color is drawn. During this step, no Gold is gained if a gold die is drawn. Once all players have a Class card, return all dice to the dice bag. Alternatively, instead of drawing dice, players may select the Class card they want in reverse turn order, ending with the Start Player. 5 Shuffle the deck of Backstory cards and the deck of Alignment cards separately. Deal one Backstory card and one Alignment card to each player, and give each player a Player Aid card. Return any unused Backstory, Alignment, and Player Aid cards to the box. 6 Each player places their Backstory and Alignment cards on their Character Sheet and takes the two tracking tokens of their Class color. One is placed on the center space of their Alignment card. The other is placed on their Class card. 7 Separate the Market cards into single-dot and double-dot card piles (dots are in the upper right corner of the cards). If playing with three players, discard three cards from each pile, or if playing with two players, discard seven cards from each pile. Shuffle the piles separately and place the single-dot pile on top of the double-dot pile to form the Market deck. 8 Create the Market by drawing cards from the Market deck equal to the number of players plus one (3/4/5 cards for 2/3/4 players, respectively) and placing them face up in the center of the table. 9 Line up the Initiative cards in the center of the table in numerical order. With three players, return the "5" card to the box. With two players, also remove the "4" card. This way, the number of Initiative cards in play equals the number of face up Market cards in play. For two players, place one Gold on the "2" card. For three players, place one Gold on the "2" and "3" cards. For four players, place one Gold on the "2", "3", and "4" cards. 11 Beginning with the Start Player, each player randomly draws their starting dice from the bag. The number of dice each player draws is equal to the number of players plus four (6/7/8 dice for 2/3/4 players, respectively). Dice must be placed in the leftmost empty space in an Attribute Row. Attribute Actions are not taken during setup. For each Attribute Row that is filled with 3 dice, gain 1 Gold. For each gold die drawn, gain 2 Gold. Exception: A player with the Thief Class card takes 4 Gold for each gold die drawn, instead of 2. 13 The Start Player begins the game. Roll Player is played over a series of rounds, each divided into four phases: the Roll Phase, the Dice Phase, the Market Phase, and the Cleanup Phase. For two players, roll three dice. For three players, roll four dice. For four players, roll five dice. The Start Player then places the lowest value die on the "1" Initiative card, the second lowest value die on the "2" Initiative card, and so on, until all Initiative cards are filled with dice. If there are ever multiple dice with the same value, the Start Player decides where the dice are placed. Example: In a three player game, there are four Initiative cards in the center of the table, with a Gold on Initiative cards "2" and "3". Eric is the Start Player, so he draws four dice from the bag and rolls them. He rolls a green 6, a red 1, a gold 4, and a purple 6. He then places them in order on the Initiative cards. The red 1 goes on the "1" card, the gold 4 goes on the "2" card, and Eric decides to put the purple 6 on the "3" card and the green 6 on the "4" card. Select an Initiative Card: Each player chooses an available Initiative card, with its die and any Gold on it, and places it in front of their Character Sheet. Place Dice: Each player places the die from their Initiative card in the leftmost empty space of any Attribute Row. 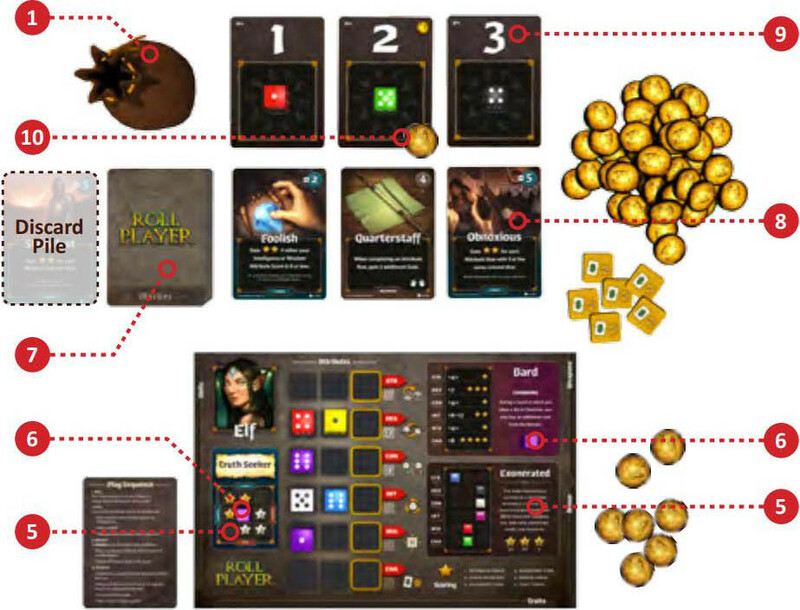 Collect Gold - Each player then gains Gold: the Gold on their Initiative card, if any; 1 Gold from the supply if the player 's die was placed in the final space of an Attribute Row; and 2 Gold from the supply if the player placed a gold die. 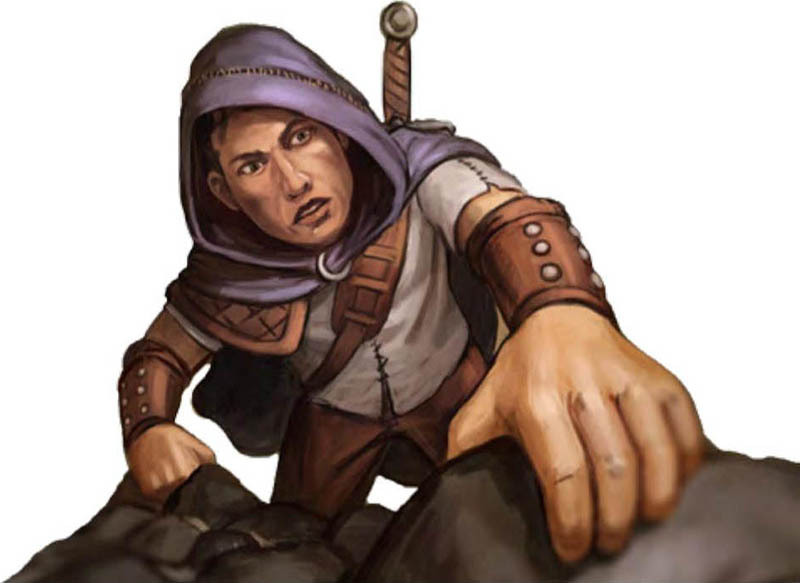 Strength: Placing a die in the Strength Attribute Row allows the player to change the face value of any die on their Character Sheet to the face value on the opposite side of the die. Example: A player could turn a 1 into a 6, a 2 into a 5, etc. 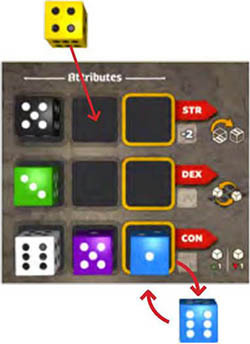 Dexterity: Placing a die in the Dexterity Attribute Row allows the player to exchange the placement of any two dice on their Character Sheet without changing their current face values. The player may not move a die to an open space using this Attribute Action. Constitution: Placing a die in the Constitution Attribute Row allows the player to increase or decrease the face value of any die on their Character Sheet by one. Dice values do not "loop". Thus, a die with a value of 6 cannot be "increased" to a 1, nor can a 1 be "decreased" to a 6. Intelligence: Placing a die in the Intelligence Attribute Row allows the player to choose any die on their Character Sheet and reroll it. The player may choose to keep either the new value or the original value. The die is then returned to its original space on the Character Sheet. Wisdom: Placing a die in the Wisdom Attribute Row allows the player to move the tracking token on their Alignment card one space up, down, left, or right. Charisma: Placing a die in the Charisma Attribute Row allows the player to take a Charisma token. During the Market Phase this round, the player may spend any Charisma token in place of one Gold when buying a Market card. Players may use an Attribute Action to affect the die that was placed this round or any die placed in a previous round. Only one Attribute Action may be taken per player in the Dice Phase. Dice that are moved or have their face values changed as a result of an Attribute Action do not trigger additional Attribute Actions. Example: A player places a die in the Dexterity Attribute Row and uses the Dexterity Attribute Action to exchange a die between Charisma and Strength. This triggers neither the Charisma Attribute Action nor the Strength Attribute Action. Once all players have completed their turn during the Dice Phase, one Initiative card will remain in the center of the table. Example: Eric selects the "2" Initiative card (seen in the example on page 8). He gains the Gold on the card and places the gold die from the card into the second space in his Strength Attribute Row. He gains 2 more Gold for placing a gold die on his Character Sheet, and he uses his Strength Attribute Action to flip a blue die that he placed in Constitution during a previous round from a 1 to a 6. During the Market Phase, each player has the opportunity to buy a card from the Market. The player order for this phase is dictated by the numbers on the Initiative cards that were chosen during the Dice Phase. The player with the lowest value Initiative card buys first, followed by the next lowest, etc. To buy a Market card, the player pays the cost shown in the upper right hand corner of the card to the Gold supply. The player places the bought card face up in the appropriate area of the player 's Character Sheet. New cards are not added to the Market during the Market Phase. There is no limit to the number of Armor, Trait, or Skill cards a player may acquire. A player may not equip (i.e., have) more than two hands worth of Weapon cards. At any time, a player may discard a Weapon card from their play area to the Market discard pile. Discarding allows a player to buy a new Weapon card without going over their Weapon card limit. If a player buys a Trait card, they immediately move the tracking token on their Alignment card as indicated by the arrow icon on the card, if possible. If a player buys a Skill card, they may use it immediately. (SEE page 11 for details about using Skill cards). If the current player cannot or chooses not to buy a card, they must select a card from the Market, and add it to the Market discard pile. They then gain 2 Gold from the supply. After a player has either bought or discarded a Market card, they return their Initiative card to the Initiative card row in the center of the table. This helps players keep track of who is next in the Market Phase. At any time during the game, any player may look through the Market discard pile. Example: In the Dice Phase, the Start Player, Eric, chooses the "2" Initiative card; the next player, Isaac, chooses the "1" Initiative card; and the last player, Claire, chooses the "3" Initiative card. In the Market Phase, Isaac goes first, since Isaac chose the "1" Initiative card during the Dice Phase. Because there are three players, there are four Market cards available. Isaac wants the Reckless card, which costs 6 Gold. He decides to use his Charisma token, which he discards, and pays 5 Gold to the supply. Isaac places the Reckless card in the Traits area of his Character Sheet and adjusts the tracking token on his Alignment card as indicated by the arrow icon on the Reckless card. Eric goes next, because he chose the "2" Initiative card. He decides not to buy a card. Instead, he discards the Leather Gloves card from the Market and takes 2 Gold from the supply. This leaves two cards still available in the Market for Claire. She decides to buy the Quarterstaff card. Each player discards any unused Charisma tokens. Each player may refresh one exhausted Skill card by turning it upright (SEE page 11 for more detail about Skill cards), thereby making it available for use in the next round. The Start Player returns the remaining die in the Dice Pool to the dice bag and discards the remaining Market cards. The Start Player draws a new set of Market cards for the next round (equal to the number of Initiative cards) and places them face up to form a new Market. If the Market deck is depleted and additional cards need to be drawn, the Start Player shuffles the discard pile (single dot and double dot together) to create a new Market deck before drawing the necessary cards. The Start Player places 1 Gold on any Initiative cards that do not have Gold on them, if they are neither the first nor the last card in the row. Initiative cards may never have more than 1 Gold on them. The Start Player passes the dice bag to the player to their left. That player becomes the Start Player for the next round. When a player buys a Skill card from the Market, it is immediately available for use. 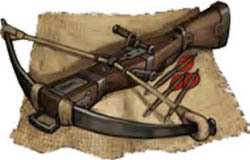 To use a Skill card, a player moves the tracking token on the player 's Alignment card in the direction indicated by the arrow icon shown in the card's Description. Then, the player uses the special ability of the card, if they wish. Finally, the player exhausts the card by turning it sideways, to show that the card cannot be used again until the card is refreshed (i.e., turned upright). If it is not possible for the player to move the tracking token due to its position on the player 's Alignment card, then the Skill card cannot be used. Skill cards may only be used if they are in the upright position. Skill cards may be used at any time (even during another player 's turn), unless noted in the card's Description. Each player may refresh only one Skill card per round and only during the Cleanup Phase. There are 4 ways for a player to gain Gold in Roll Player (in addition to gaining it by using special abilities from Skill, Weapon, and Class cards). Gain 2 Gold when placing a gold die on a Character Sheet. Gain 2 Gold when discarding a card from the Market instead of buying one. Gain 1 Gold when placing the third die in an Attribute Row. Gain 1 Gold when selecting an Initiative card with Gold on it. The game ends at the completion of the round in which all players have filled every Attribute Row on their Character Sheets. Then, the players calculate Reputation Stars to determine the winner! Reputation Stars are awarded during Final Scoring (and not before). 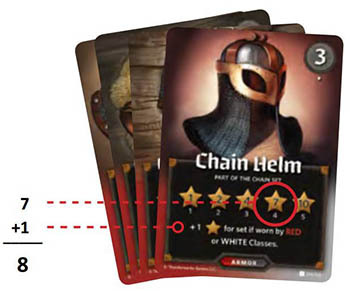 During Final Scoring, each player uses the tracking token from their Class card and the chart on the back of their Player Aid card to tally their Reputation Stars. Attribute Goals - A player 's Class card includes goals for each Attribute Row on the player 's Character Sheet and shows how many Reputation Stars the player will gain for meeting each goal. 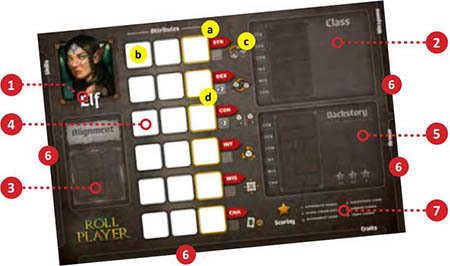 The player adds up the face value of the dice in a particular row on the Character Sheet, adjusts the total for any Race Bonus or Penalty shown on their Character Sheet and Weapon cards, and then checks the adjusted total against their Class card to see if it meets the goal for that Attribute Row. If the goal is a single number, that exact number must be met. Attribute Scores over or under the target goal earn no Reputation Stars. If the goal is a range of numbers, the player 's Attribute Score must have a value within the listed range. If the goal includes a plus sign +, then the player 's Attribute Score must be equal to or higher than the indicated number. Class Color Dice - Each die on a player 's Character Sheet that matches that player 's Class color is worth one Reputation Star. Alignment Card - Each player checks the position of the tracking token on their Alignment card and adds or subtracts the number of Reputation Stars underneath the tracking token. 6 Reputation Stars for all 6 matches Armor Cards - Players earn Reputation Stars for sets of Armor (one or more cards of the same type of Armor) and for their character being the Class color specified on the Armor card. Each player sorts their Armor cards by type into sets: Chain, Leather, and Mystic. For each set, the player counts the cards in the set and, using the numbers under the stars on the cards, matches their total to a star. The player earns Reputation Stars equal to the number within that star. In addition, for each set, a player earns an extra Reputation Star if the cards in the set match their character 's Class color. This bonus is earned per set, not per card. Example: If a Cleric (a white Class) has four pieces of Chain Armor, its player receives 8 Reputation Stars (7 Reputation Stars as indicated on the Armor card plus 1 Reputation Star awarded for the set, as a Class bonus). Trait Cards - Each player adds the Reputation Stars earned from their Trait cards. The player with the most Reputation Stars wins! If there is a tie, the tied player with the most Gold wins. If there is still a tie, the tied player with the fewest number of dice in their Class color on their Character Sheet wins. If there is still a tie, the tied players rejoice in their shared victory or play again!